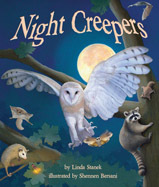 An explanatory book about nocturnal animals, Night Creepers gives brief explanations on their behaviors, patterns, sounds, and where they live. 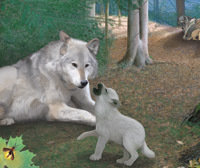 For instance, children will learn that bobcats are solitary animals that live alone and that the howls of gray wolves can be heard miles away. Skunks live mostly in North America, while white-tailed deer live from southern Canada to northern South America. Well-drawn illustrations of the animals round out this factual and interesting book. The 'For Creative Minds' section in the back of the book further cultivates lessons with information on when animals are most active and animal adaptations. There's also a 'Match the Eyes' activity. Night Creepers is a Fall 2017 release from Arbordale Publishing. One person will win a book copy of Night Creepers. I am definitely an early worm. I am up before 5:30 and get most of my things done before my family gets out of bed. Most days, I am an early worm, but some days, the pain is so bad that I am also a night owl. I was actually a night owl before I had kids, but then I found that the best time to get some quiet time for me was the early morning before they woke up. I am an early worm. I get up at 4AM to get ready for work, so I have no choice! I guess I'd consider myself an early bird these days because my son likes to wake up early. I am usually more of a night owl. I like the quiet time between 3 am & 5 am. I am an early worm, definitely not a night owl! early worm, although nights are okay too. Its afternoons that get me. I was born with the Night Owl gene. My Mom was a night owl too. I'm definitely a morning person! I am a night owl for sure. We are definitely night owls in our home, too. I am a night owl living in an early worm world. I'm a night owl. Thanks! I'm definitely a night owl. I despise mornings. I'm definitely an early worm and have been so for decades of having to be at work at 7:15 am. "Leave a comment on this blog post with whether you consider yourself to be a night owl or an early worm." Generally, I am a night owl. I'm definitely a night owl! I go back and forth between being a night owl and a morning person! I have always been a night owl. I am both. I go to bed late and get up early. I am definitely a night owl. I have been ever since I was a kid. We are all night owls in my house! I'm a night owl as I have been working overnights for quite a while. I'm an early worm. I'm much more productive in the morning than in the evening. I'm both a night owl and early worm. I most definitely consider myself to be a night owl but at times can be an early worm. I'm definetely a night owl...I hate getting up early, I'd much rather stay up late. I am definitely a night owl. Unfortunately- the rest of the world disagrees with my sleeping hours. i am an early bird. i love to get up early and tackle the day. I think I am neither! I like to go to bed early and sleep late!! I am an early worm. I have been up since 2:30 am! I would be a night owl! I'm definitely a night owl. I remember all the way back to very young days getting in trouble for playing in bed instead of going to sleep. I am for sure a night owl. I am totally a night owl! So when everyone else is in bed I can finally let loose get things done and be myself. Even though I am so tired I can barely keep my eyes open. I consider myself to be a night owl.